When I told my colleagues that I was speaking to Microsoft’s general manager of Surface Engineering, Pete Kyriacou, about the hardware design of the Surface Laptop, they all had the same question: will that fancy Alcantara fabric on the deck of the laptop really hold up? It’s a fair question. The idea of taking a thing you rest your greasy mitts on every day and putting any kind of fabric on top of it seems like a recipe for grossness. And though in my experience the similar fabric on a Surface Pro 4 Type Cover has held up fine for me with light use, there have been a few reports of stains out there. The world “luxury” kept coming up again and again in the conversation. (Yes, toward the end the word “chamfered” also appeared in the context of laser-cutting the edge of the fabric.) “Luxury” is an odd term for a machine that seems custom-built to supplant the de facto everyperson laptop, the MacBook Air. Does Microsoft want this to be a laptop for students, a laptop for everybody, or a luxury product? All of the above, apparently. 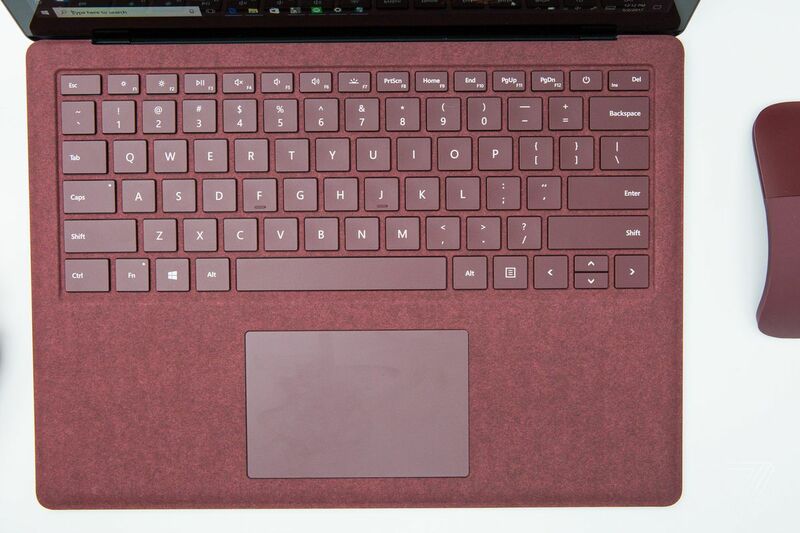 But the return to the word over and over definitely implies that the fabric on the Surface Laptop will require occasional care and attention. And so to make that care feel normalized, Kyriacou tries to put the laptop in the luxury category, where such care may feel a bit less onerous. Just like anything luxury that you buy, like great handbags or a pair of shoes or even expensive cars, there is a care that’s needed for the device. And so from the materials perspective, we will ask customers — specifically customers who might stain it or drop something on it — to go ahead and wipe that right away. There’s a simple way of doing that with a microfiber with a soap and water solution on it. You don’t need any special chemical and you can wipe it off. Then just care [for it in the same way] that would go into anything that luxurious. That’s more of a periodical thing, not super frequent, something you might look at doing every six months or something. And so if you think of the livelihood of this laptop, somewhere between four and five years, it’s not that often you have to do it in terms of taking care of it. I sent the above quote to The Verge’s resident Luxury Editor, Micah Singleton, without telling him what it was about. His first reply: “What kind of advanced troll is this?” Later, he and I discussed the various forms of Alcantara in cars and Louis Vuitton bags. It seems like the fabric’s resistance to staining is all over the map, depending on how the fabric is used and treated. So if you get a Surface Laptop, I don’t think you have to worry too much — so long as you don’t abuse it too much. It’s perhaps a little more work than a metal laptop, but Kyriacou notes that “even when you test metal laptops, those get dirty.” My own MacBook is proof of that.